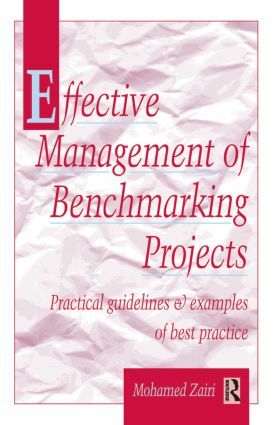 Effective Management of Benchmarking Projects shows you how to apply benchmarking to a variety of projects. Effective Management of Benchmarking Projects equips the project team or manager with all the necessary competence for managing projects effectively. This practical book begins with definitions of 'what to benchmark' and ends with a stimulating real case study where a benchmarking project was conducted by observing all the necessary rules and with total adherence to the various protocols. Rank Xerox, D2D, American Express, Rover, Texas Instruments. It is a rewarding read written by someone who has clearly researched long and hard and deeply into the subject. The author offers valuable tools and techniques, protocols and model documents, to anyone sufficiently interested to open his book. In fact, Zairi's book is subtitled: practical guidelines and examples of best practice, a claim it meets with ease. Introduction; Rank Xerox: The place where the benchmarking story started; The strategic application of benchmarking for best practice: A prioritization tool; Partner selection; The ethics of benchmarking: How to handle secrecy and sensitive issues; The value of industrial visits; The value of benchmarking awards; The process of benchmarking in practice; The diversity of benchmarking: Examples of best practice; Bringing it all together: Effective project management; Index.